Stetson University is really the premier campsite in Central Florida. Located in DeLand, only 35 miles from Orlando and 23 miles from Daytona Beach, Stetson offers Division 1 athletic facilities on its 175 acre picturesque campus. The Edmunds Center field house, Hollis Center, the practice and game fields are all top notch. In August 2012 Stetson opened the state of the art Athletic Training Center together with two new football practice fields and a renovated Spec Martin Stadium. In 2013 Stetson played its first intercollegiate football game since 1957 under the leadership of Head Coach Roger Hughes. The campus itself has been designated by the National Register of Historic Places as the “Stetson University Historic Campus District”. It is beautifully landscaped with abundant Palm trees, Live Oaks, etc. A number of buildings date back to the 1880’s. Stetson has been the location for a number of motion pictures, most notably “The Water Boy” starring Adam Sandler. Other movies include “From Earth to the Moon”, and “First of May”. 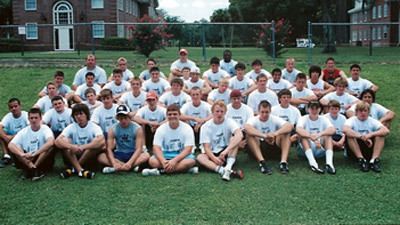 The University has also has hosted training camps for a number of Florida professional teams. There isn’t any place in the world where you’ll find more things to do than Central Florida. Take in the world class theme parks in Orlando, visit the Kennedy Space Center, or go back in time and take a stroll on the sidewalk in Downtown DeLand, a pontoon boat cruise on the St. Johns River (Manatees are everywhere at the right time of year), or spend the day at the beach. Here’s a very brief list with some of Central Florida’s attractions.